I have used many of the Aradani elf ear products over the years. I started using their ears the same time I started costuming back in 2004, when I dressed as an elf from Lord of the rings and since then I have used a variety of Aradani ears. The pair of ears that stand out the most to me and happen to be my favorite are the small anime elf ears, the length of them are not to short or long so I don’t have trouble putting them on. Their versatility has allowed me to use them in many different costumes ranging from game costumes, anime costumes, fairy costumes, to elf costumes and even a couple Elfquest costumes for my husband and I.
Elfquest was one of the first comic series I ever read so I was very excited to do some costumes from the series. 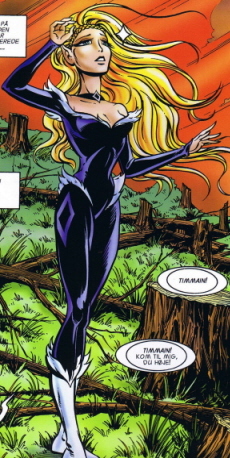 The Aradani anime elf ears where the best choice for the costume since it matched the look of the elves in elfquest the best. The two characters I have costumes as are Aroree and Newstar. I costumed as Aroree back in 2009 at Dragon con with a group of other Elfquest costumers. I chose Aroree not only because my body type fit the character very well, but also because of her character development in the series . I decided to do one of the alternate costumes of her from later in the series. 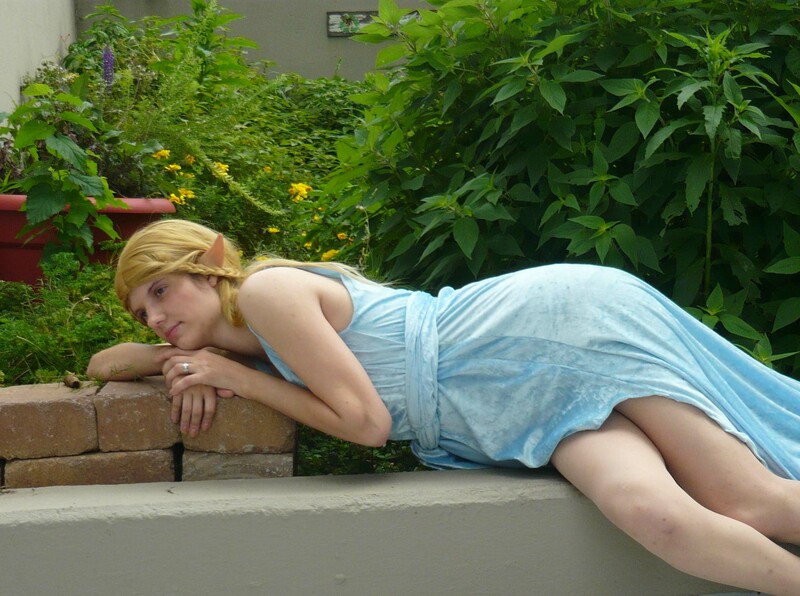 The elf ears, of course I got from Aradani, and the costume itself is two parts – the top was a leotard and the bottom was a pair of spandex pants. I purchased both of them as at the time my sewing skills where not what they are now. However I did hand paint the detail on the pants as well as glue the faux fur trim on the collar and around the bottom of the leotard. The wig I also styled myself, it being made of two parts – that being the main wig and the braid. The braid was excess hair cut from the wig, braided and put onto a hairband. The makeup was simple I just went for a natural look and I did do a little accent to my eyes. 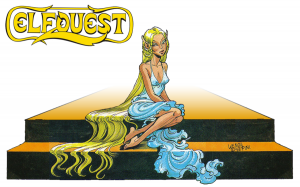 Newstar was a different process, I costumed her because this past Dragon*con the creators of Elfquest would be in attendance and I could not pass the opportunity to meet them and costume as one of the characters again. I chose Newstar for a similar reason I chose to do Aroree – that being her body type fit me well and because she is one of the most beautiful characters in the series. 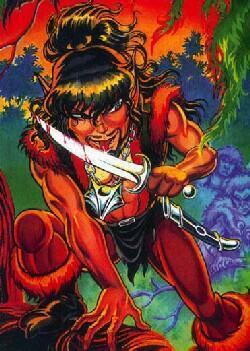 She was also dubbed by the creators to be the “elfiest elf”. 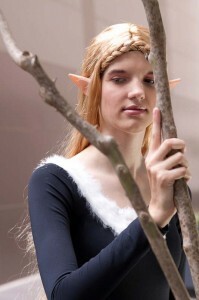 I used the same anime elf ears again for this costume. The dress was velvet and was something I had used in a couple different costumes already but I decided to alter the dress into what it currently is now. 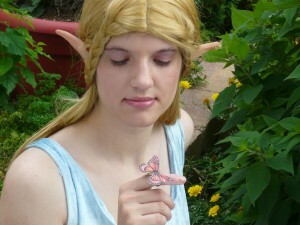 In the series, the elves in that part of the world wear clothing of a fine “moth” fabric. I could have gone with a sheer chiffon, but as I had already stated – I had something on hand to work with. I am very pleased with the results, the sky blue velvet looks like a liquid jewel flowing around me and I think it worked well showcasing the beauty of the character. The wig I styled by just doing two simple braid loops to the side and then tying them together with a hair tie. For a small bit of added detail, I had purchased a hair tie that had little white flowers and clear crystal jewels in them. I thought it would be a nice touch to the costume. Also for a final touch, I made a little butterfly prop to illustrate peace and serenity. 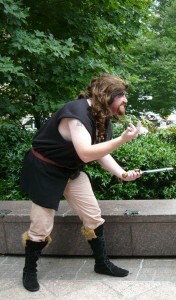 For my Husband, I had requested he dress as Bearclaw, because I liked the character. He is very cunning and well… not to bad to look at. For his costume we used the large elf ears mostly because they could fit my husbands ears well. For the costume I made him a tunic out of simple knit fabric for comfort and also so he did not over heat. I glued on the fir trim myself and he added the trim to a pair of moccasins. He already owned the belt and the cotton pants, but I did dye the pants to make them a bit more tan and because it also added a bit of texture to the look of the pants. The wig we bought and styled ourselves and the necklace was made from a large claw and cord from Tandy Leather. 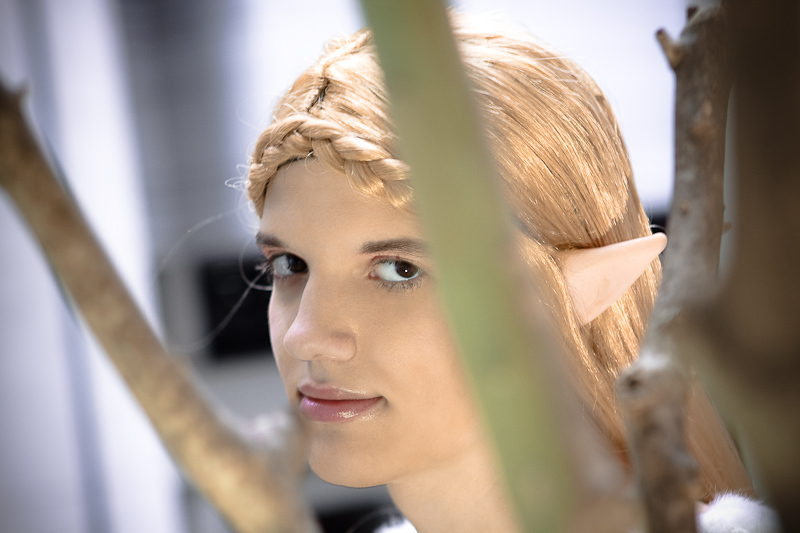 The Aradani elf ears are the only ones I ever use and the only place I buy them from , they are the only ones I will recommend to others, they have a wide variety of ears and they have a very realistic look to them. And anytime you buy a set of ears, the Aradani staff are always happy to assist you putting them on! They have me as a customer for as long as they keep making their ears! 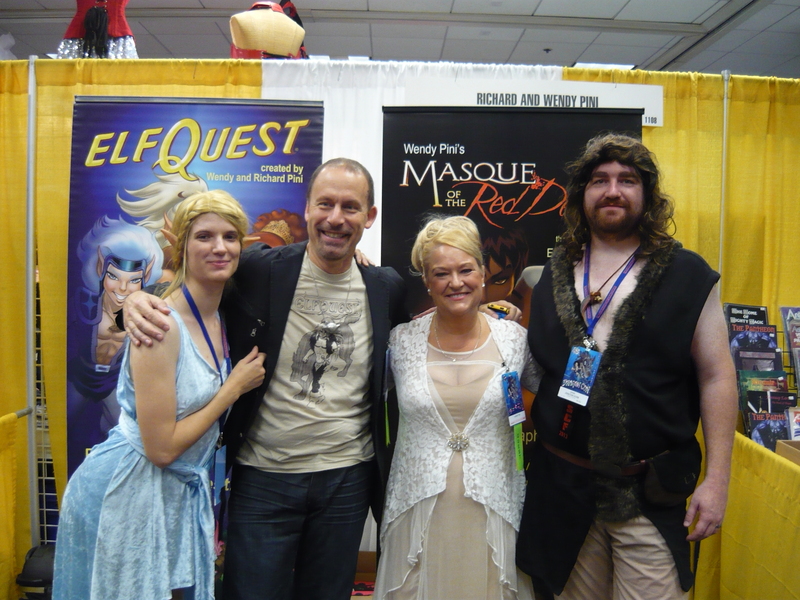 Us with ElfQyest creators – Wendy and Richard Pini!